Amos Gould came to Owosso, as did several other members of his family, from New York State. 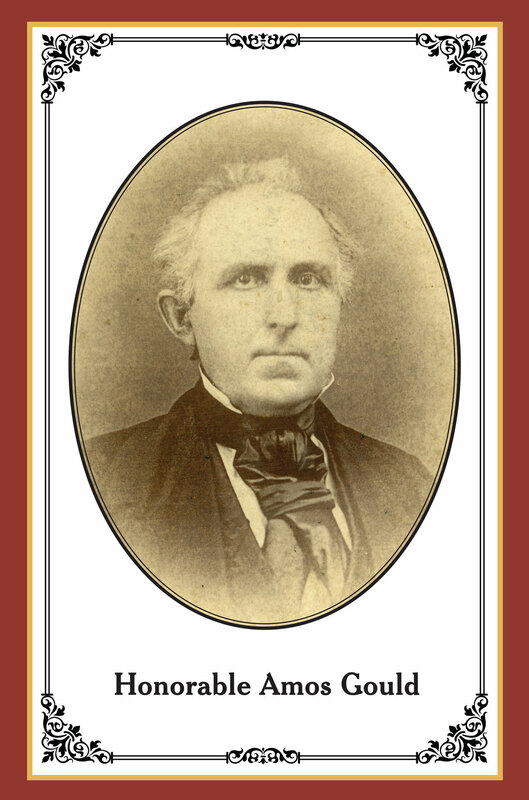 He moved to Owosso, Michigan, in 1843 and in the next 40 years, his services to the public identified him, not only on behalf of Owosso, but also to the larger development of the state. Gould was elected in 1859 as Owosso's first mayor. He founded Owosso's first bank, organized the first school district, brought in the first school teacher, organized the first cemetery association (Oak Hill) and organized the first Congregational Church. Gould was also the first lawyer in the city and served as prosecuting attorney and probate judge. Amos was mayor when the Civil War broke out, and he and his brother, Ebenezer Gould, flipped a coin to decide which would enlist and which would remain home to continue the law practice and take care of both families. Amos lost the coin toss. Ebenezer went to war and came back to Owosso a hero while Amos stayed home to care for the family. Gould served as the attorney for the Detroit and Milwaukee railroad company, 1852 – 1881, a position which was quite involved with the acquisition of land four it's right-of-way from Pontiac westward to Grand Haven, Michigan. He also promoted the establishment of the Amboy, Lansing, and Traverse Bay Railroad (one of Michigan's first land grant roads) and directed construction of its first section from Owosso to Lansing, Michigan. Amos also organized the Michigan Central Railroad when it was extended from Jackson to Saginaw and secured the right-of-way for the Ann Arbor Railroad. He was supervisor for Owosso Township from 1844 to 1850, probate judge in the fall of 1844, and a state senator in 1852. After many years of public service, he retired to his home where the last twenty years of his life he was engaged in private business until a few days prior to his death on Sunday, May 14, 1882. The distinctive appearance of the Gould House reflects the distinctive life of its builder. Gould completed construction of the house on its current site in 1860, locating it just south of his prior residence, a frame built house in 1843. The earlier Gould home was subsequently moved to a lot on King Street, where it remains an occupied residence today. The Gould House was initially constructed in the style of an Italian villa. It was remodeled in 1873 to add a mansard roof, ornate front and side entrances, and its creamy yellow brick, unique among Owosso homes. Mary Lena, the last member of the Gould family to live in the house, had the upstairs converted into two rental apartments in 1938. The Owosso Historical Commission, representing the City of Owosso, purchased the house in 1979. Current efforts to preserve and maintain the Gould House are underway by the Owosso Historical Commission. Amos Gould House, circa 1865. To the right of the house can be seen the first house built by Amos Gould, circa 1848. The old house now stands at 115 West King Street in Owosso.